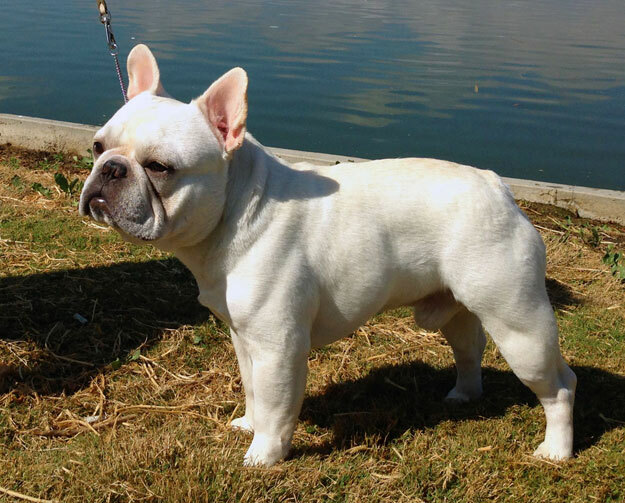 A very special pedigree substantial classic Frenchie at 26 pounds. Franklyn Dylan: Where to start with him. Frozen for 15 years this is a classic lots of substance with quite a substantial head Frenchie. At just a year I don't think his brains have kicked in yet. His, underjaw stunning as are his tight feet and straight front legs. He has plenty of rear angulation and a correct topline. He’s a classic. In the show ring low and behold, the long time judges go for him. Good to know he would be recognized and appreciated after all these years.. I am very proud to add the renowned Balihai Frenchies and Suma Frenchies, to his name. Of all the historical lines that faded away along with the breeders. It is an honor to be able to bring them back to life. Frankie - D" as he affectionately, enjoys being called has a bright future ahead of him. February 1st 2016 update - Now a group placer as of January 30th 2016 Franklyn Dylan became a American Grand Champion under long time breeder judge Robin Stansell at the Orange Empire Dog Show.